We are proud to announce that Sinergise partnered with Airbus Defence and Space to provide Pléiades imagery, which will be available for purchase and distributed through Sentinel Hub services. We’ve already started with integrating new datasets into Sentinel Hub and we will keep you posted on the up-dates. Pléiades satellite imagery is provided by two twin satellites, Pléiades 1A and Pléiades 1B, which are operating as a constellation in the same orbit. They are delivering very-high resolution optical data products and offering a daily revisit capability for the whole globe. The Pleiades constellation is designed to obtain data in double-quick time. Its capability to acquire imagery in less than 24 hours presents a perfect source for usage in response to a crisis or natural disaster. You can use Pléiades products for regular monitoring, precision mapping and photointerpretation. By using the Airbus’ satellite tasking service the image acquisition time becomes faster and to access the new images takes less time (just a few hours in certain cases). Pléiades 50-cm-resolution products are available at three processing levels, Primary, Projected and Ortho, in all spectral combinations. Continue reading for more information on spectral combinations and spectral bands. 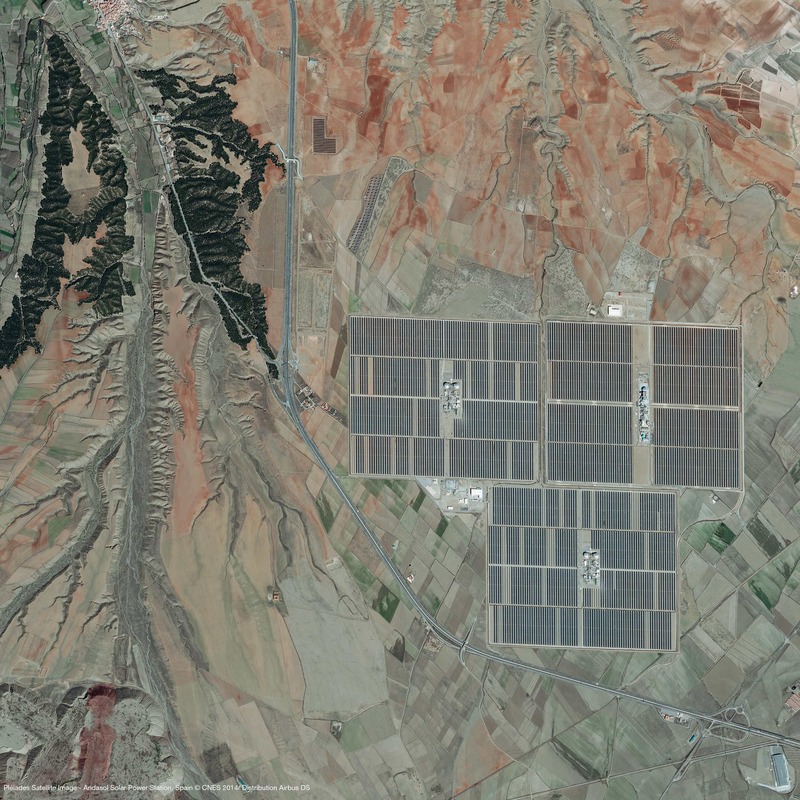 Pléiades Satellite Image - Andasol Solar Power Station, Spain © CNES 2014, distribution Airbus DS (Zoom into the original image at Airbus, and inspect the details). The Pléiades imagery will be available through our services which provide an easy integration into any kind of GIS application. The purchased images will be also available in full resolution for download as jpg or GeoTiff files. Contact us for more information!